Nanyang Technological University, Singapore, and Volvo Buses have launched the world’s first full size, autonomous electric bus. The electric bus is a 12 metre-long single-deck bus with a capacity of almost 80 passengers or 36 seated and is now undergoing field trials in Singapore. The bus has been developed with Singapore’s Nanyang Technological University (NTU), in partnership with the land transport authority (LTA) who has developed and conducted autonomous bus trials for fixed route and scheduled services. 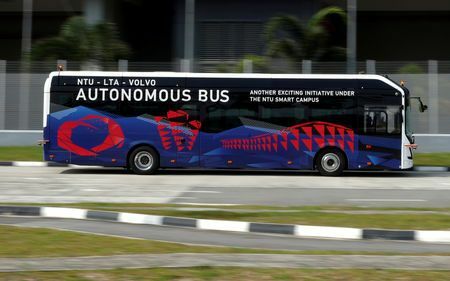 The autonomous bus is a Volvo 7900 electric bus equipped with sensors and navigation controls handled by an artificial intelligence (AI) system, and is the first of two buses which has undergone preliminary testing at the Centre of Excellence for Testing and Research of Autonomous vehicles at NTU (CETRAN). “This fully autonomous electric bus will play a role in shaping the future of public transportation that is safe, efficient, reliable and comfortable for all commuters. It will soon be tested on the NTU Smart Campus, which has been home to a number of innovations as a living testbed for technologies that impact the human condition and the quality of life,” said NTU President Professor Subra Suresh. Volvo partner ABB will also be developing a fast-charge solution, one that is based on the OppCharge concept and is suited for autonomous charging in depots as well as in running traffic. It has been said that a Charge of 300 kW is offered via a pantograph on the infrastructure, and the setup will recharge a bus battery in three to six minutes. The Volvo bus is the first of two that has undergone preliminary rounds of rigorous testing at the Centre of Excellence for Testing and Research of Autonomous vehicles at NTU (CETRAN). Plans are in place to test the bus on NTU roads and to subsequently extend the route beyond the NTU campus.